What does it take to make policy work for kids? Letters to lawmakers. Personal stories. Rallies at the capitol. Your action, your gift, your time. You make policy work for kids. Children's Alliance is powered by members. We'll give you the tools to take action for kids when it counts. Join today. Want a speaker about kids' issues and advocacy at your community event? Looking for tips about how to spread the word about kids' issues in your community? Contact Emijah Smith, Community Organizer. Every penny you give fuels the movement to make policy work for kids. 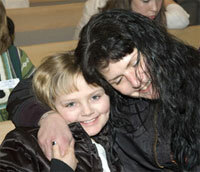 The work of the Children’s Alliance creates results that change the lives of kids and families. Give today. Send a message. Speak up. Tell your story. The Children’s Alliance gives you the tools to make an impact. Take action now—or browse a list of past actions.